Though seemingly a positive step forward for our city, many have lamented that CLERB has insufficient power to accomplish its assigned tasks. For instance, CLERB can only hear a case after Memphis Police Department’s (MPD) Internal Affairs (IA) has completed its investigation. Moreover, CLERB has no subpoena powers, and as such, MPD officers’ presence at a CLEB hearing is purely voluntary. More troubling is the fact that the extent of CLERB’s disciplinary power is a non-binding recommendation to MPD. Last year, it came to light that, CLERB was disbanded by the Wharton administration. This occurred without notice or input of any kind either to the general public or to Memphis City Council. Still, to this day City Council still assigns a liaison to CLERB, and according to council members, continues to allocate funding for CLERB in the city budget. The webpage quoted above is still active on the city website, though the phone number goes to the Memphis Legal Department where it is answered by someone with nothing to do with CLERB. And yet our leaders wonder why the public seems so cynical without faith and trust in the government. 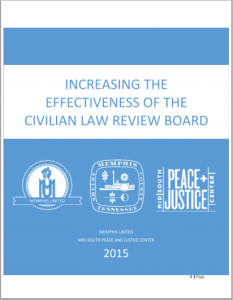 We are currently seeking to pass an amended ordinance to give the Civilian Law Enforcement Review Board the power it needs to provide transparent and accountable oversight of Memphis police. Want to help transform your community? Join our monthly giving program #MyMSPJC Sustainers!